Whether you’re wanting a good reason to commemorate and re-live your dream wedding, or simply looking to reaffirm and celebrate the love and commitment within your marriage, renewing your vows is a fun way to honour the occasion. Celebrating your “I do’s” for a second time is a romantic and sentimental event that can be as intimate as a family gathering to as large and extravagant as a traditional wedding reception. 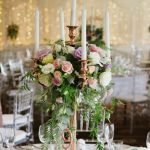 Renewing your vows is a milestone moment for your relationship, to help you plan your happy occasion we’ve found a few ideas and trends that are sure to make renewing your vows a happy, romantic and memorable affair. Chances are you’ve developed from newlyweds to parents, while your children may not have participated in your first wedding, being able to include them in renewing your vows is a thoughtful way to celebrate your marriage and the story you and your partner have shared. Pairing the renewal of your wedding vows with a milestone anniversary such as 10, 20 or 30 years of marriage is a beautiful sentiment for the occasion. It should bring back happy memories of that wonderful day when you first exchanged your vows. Inviting those who attended your wedding to celebrate your renewed vows is a thoughtful way to acknowledge an anniversary. If your wedding was before the days of Instagram and Snapchat, renewing your vows is the perfect way to incorporate fun trends that are a current staple in today’s wedding ceremonies. Combining contemporary features such as hashtags or photo booths will give your celebration fun details and have guests leaving with great memories. You can every secure a filter that makes your celebration a stamp on your guests images forever. As renewing your vows is not a legal ceremony, no license or paperwork is required. The ceremony is symbolic, sentimental and romantic, this meaning you can have a close friend or family member officiate to make your day really special. Typically, the organisation of renewing your wedding vows is a task done with the help of both parties, however the most noteworthy and unforgettable ceremonies are those performed unrehearsed. With a beautiful location, interesting ideas and friends and family in attendance your dream romantic event of renewing your vows is sure to leave you and your partner in a wedded bliss. With a variety of award winning function rooms catering for celebrations of all sizes, Waterside Events is here to help ensure your special day is everything you’ve dreamed of. View our gallery and speak to our expert staff today.